Extravagance ? The swimming pool is there, quite simply, for your enjoyment, and this pleasure is available all year round. 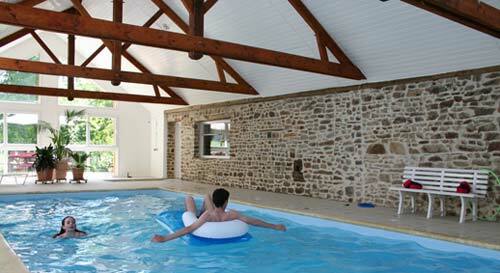 The swimming pool is integrated with the gite and is accessible from the living room (see plan). The pool is heated to a temperature of 28C whilst the room is heated to a constant 28°C. In the middle of winter, when swimming in the pool, what luxury to see that outside the countryside is freezing ! There is a south facing terraced area, (28m2) giving uniterrupted views of the countryside. There are 2 sunbeds for your use. The swimming pool conforms to french health and safety standards. There is an access code to the pool to avoid children being in the pool unsupervised.